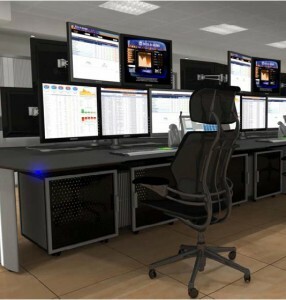 The Montepio of Portugal had the need to renew their trading room, a place where 8 operators should be aware of a significant flow of economic information. The challenge for the GESAB team was to devise a configuration favoring the ergonomics and the effectiveness of 8 operators and, at the same time, guaranteeing their eye contact and direct communication. Also, due to the peculiarities of the control room, the project should take into account the large amount of wiring that runs through the facility, which, at that time, was a problem. For this control room (trading room), GESAB proposed the Advantis control console, which allows a total adjustment to the special requirements of an operating environment 25x7x365. Moreover, the console is complemented by Humanscale monitor supports, fully configurable and adptables to the needs of each operator. Following the installation, GESAB has been required to restructure the room and add 4 more control positions.